Thank you for taking a moment to complete our appointment request form. Email submissions are checked periodically and we will return all requests in a timely fashion. If you need immediate assistance, please call Gail at 719-593-9182. We appreciate your trust and confidence in our office and look forward to seeing you! 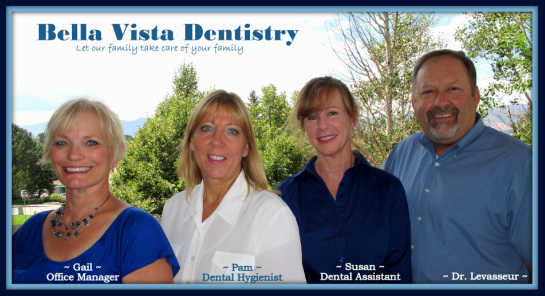 Bella Vista Dental is the absolute BEST! My family and I disliked other practices where we didn't know who was going to provide dental treatment each time we showed up for an appointment. Everyone at Bella Vista is extremely nice and when we've had issues requiring immediate attention, they made sure to schedule us in. They listen carefully to our concerns; making it obvious they truly believe in customer satisfaction." "This is the dental office you'll wish you would've found 'the first time'! Dr. Levasseur and his team truly live up to t...heir mission of treating you not just as a valued dental client but as if you were a family member. This is both a very professional and always personable dental office. I appreciate being treated so well at Bella Vista after years of painful (and sometimes bad) dentistry as I know that I am receiving great dental care where each treatment plan is thoroughly discussed and they stand behind their dental work. Thank you from the bottom of my heart for being a rose among so many thorns in the dental industry." "My family has been going here for almost 16 years I believe and I have always received the best treatment and advice! Definitely the best in the Springs!" "I actually like going to the dentist because of these guys! My family has been going here since I was a little kid they are like family now."